DominatorTree Class - Concrete subclass of DominatorTreeBase that is used to compute a normal dominator tree. Definition at line 46 of file MachineDominators.h. Definition at line 56 of file MachineDominators.cpp. This creates a new node as a child of DomBB dominator node,linking it into the children list of the immediate dominator. Definition at line 181 of file MachineDominators.h. Referenced by insertInstWithExecFallthrough(), isImmValidForOpcode(), and loadSRsrcFromVGPR(). changeImmediateDominator - This method is used to update the dominator tree information when a node's immediate dominator changes. Definition at line 190 of file MachineDominators.h. Definition at line 196 of file MachineDominators.h. Definition at line 112 of file MachineDominators.h. Referenced by dominatesAllUsesOf(), FindIDom(), llvm::WebAssemblyExceptionInfo::getAnalysisUsage(), hoistAndMergeSGPRInits(), InstructionStoresToFI(), isImmValidForOpcode(), isMinSize(), isReachable(), loadSRsrcFromVGPR(), oneUseDominatesOtherUses(), performSink(), replaceDominatedUses(), and sortBlocks(). Definition at line 118 of file MachineDominators.h. Definition at line 126 of file MachineDominators.h. References B, llvm::MachineBasicBlock::begin(), llvm::MachineInstr::getParent(), and I. Block must not dominate any other blocks. Removes node from its immediate dominator's children list. Deletes dominator node associated with basic block BB. Definition at line 205 of file MachineDominators.h. findNearestCommonDominator - Find nearest common dominator basic block for basic block A and B. If there is no such block then return NULL. Definition at line 159 of file MachineDominators.h. Referenced by FindIDom(), hoistAndMergeSGPRInits(), and isMinSize(). Definition at line 83 of file MachineDominators.h. This is the same as using operator on this class. Definition at line 173 of file MachineDominators.h. Referenced by llvm::rdf::DataFlowGraph::getNextShadow(), insertInstWithExecFallthrough(), llvm::rdf::CopyPropagation::interpretAsCopy(), and isImmValidForOpcode(). 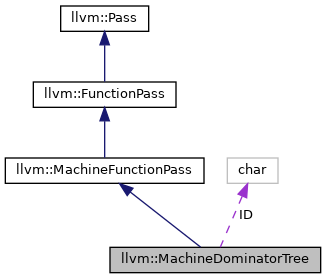 Definition at line 100 of file MachineDominators.h. Definition at line 105 of file MachineDominators.h. Referenced by llvm::createSystemZLDCleanupPass(), llvm::createX86GlobalBaseRegPass(), llvm::GraphTraits< MachineDominatorTree * >::getEntryNode(), and verifyAnalysis(). This may include multiple blocks if we are computing post dominators. For forward dominators, this will always be a single block (the entry node). Definition at line 95 of file MachineDominators.h. isReachableFromEntry - Return true if A is dominated by the entry block of the function containing it. Definition at line 219 of file MachineDominators.h. Definition at line 165 of file MachineDominators.h. Definition at line 84 of file MachineDominators.cpp. References assert(), llvm::SmallVectorBase::empty(), llvm::MachineBasicBlock::predecessors(), and llvm::SmallVectorBase::size(). Definition at line 145 of file MachineDominators.h. Referenced by llvm::createHexagonHardwareLoops(), and hoistAndMergeSGPRInits(). Definition at line 151 of file MachineDominators.h. This is best to use this method instead of directly update the underlying information, because this helps mitigating the number of time the DT information is invalidated. Do not use this method with regular edges. To benefit from the compile time improvement incurred by this method, the users of this method have to limit the queries to the DT interface between two edges splitting. In other words, they have to pack the splitting of critical edges as much as possible. Definition at line 242 of file MachineDominators.h. References assert(), llvm::SmallSet< T, N, C >::insert(), and llvm::SmallVectorTemplateBase< T, bool >::push_back(). Definition at line 61 of file MachineDominators.cpp. Definition at line 48 of file MachineDominators.cpp. Update dominator tree to reflect this change. Definition at line 212 of file MachineDominators.h. Definition at line 66 of file MachineDominators.cpp. References llvm::errs(), F(), llvm::MachineFunction::getName(), llvm::MachineBasicBlock::getParent(), getRoot(), getRootNode(), llvm::DominatorTreeBase< NodeT, IsPostDom >::getRootNode(), llvm::DominatorTreeBase< NodeT, IsPostDom >::print(), and llvm::DominatorTreeBase< NodeT, IsPostDom >::recalculate(). Definition at line 79 of file MachineDominators.h.